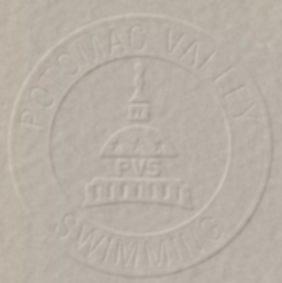 Open to all Potomac Valley Swimming registered athletes. Also, open to registered athletes of invited USA Swimming clubs. Clubs interested in participating should request an invitation from the PVS Senior Chairman, Riley Eaton at 301-367-2819 or jreaton@verizon.net or the PVS Age Group Chairman, Bill Marlin at 571-334-0987 or coach_bill@verizon.net. Swimmers shall compete at the age attained on the first day of the meet. It may be necessary to limit entries due to time constraints. All events are positive check-in at both locations. All certified officials wishing to volunteer to work this meet please contact the appropriate club officials chairman or meet referee as shown above prior to June 22. Please include your club affiliation, certifications held and sessions you wish to work. Officials volunteering should sign in at the recording table prior to the start of Warm-ups. Certified officials who have not previously advised of their availability may volunteer their services to the Referee at this time. There is no admission charge. Programs for each session will be available for a price not to exceed $2.00 each. Working officials and coaches receive a free program. There will be no concessions available for athletes and spectators at this meet. There are no awards at this meet. Fees for individual events are $3.75. Entries should be submitted using Hy-Tek Team Manager via e-mail. Events for this meet can be downloaded at 58mm062908.zip . Include in the e-mail subject heading "2008 PVS Sr/Age II - ****" with the club's initials substituted in place of the asterisks. Also include training site if your club submits multiple entries and number of timers being committed. 5:00 p.m., Tuesday, June 17, 2008.